The capital city of Vietnam, Hanoi has just been named the cheapest city in Asia and the second cheapest city in the world! The respected TripAdvisor TripIndex for Summer 2013 compares costs across 49 cities in Europe, Americas, Africa, Oceania and Asia. In the comparison are a 4 star hotel, taxi trip, cocktails and dinner, all based on two travellers. Overall Hanoi has the cheapest dinner for two people out of all 49 cities at 36.71 USD, thanks to a fantastic array of local restaurants in the city. There are a few international restaurants but the majority of the dining in Hanoi is focused around authentic Vietnamese cuisine, with street food remaining a popular option for food on the go. Daily life in Hanoi proceeds at a frenetic pace and there’s always something going on. The Old Quarter district provides a fascinating insight into the former French colonial rule, with rich period architecture, narrow streets ad traditional shopfronts. The museums are a great way to while away a few hours, with the Museum of Ethnology, Vietnam Women’s Museum and the Fine Arts Museum my particular favourites. 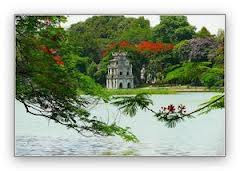 At the center of Hanoi is the serene Hoan Kiem Lake where you can (almost) forget the constant buzz of mopeds. And you can’t leave Hanoi without visiting the two key sites of the former leader Ho Chi Minh himself. His official residence is fascinating: with his books, furniture and cars on display. In fact he chose to live his last years in the modest wooden house on site rather than in the Presidential Palace. And the soviet-style Ho Chi Minh Mausoleum is a must-see where Uncle Ho lays embalmed whilst travellers and locals shuffle by. 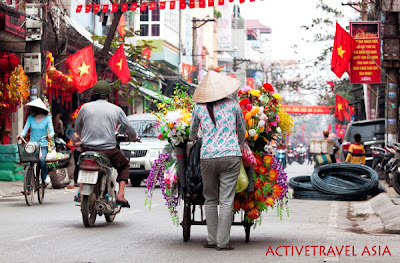 If you inspire to explore Vietnam, check out our exciting tours_Activetravel Asia, from day trips to many day experiences. All tours are run by local operators who know Hanoi and Vietnam like the back of their hand: giving you an authentic Vietnamese adventure!